GLENDALE, Ariz. — No intensity in February? Forget about that. Clayton Kershaw threw live batting practice today, and though it’s all about getting the work in at this point, he meant business, grunting on his pitches, shouting an exclamation when one missed its target and only grudgingly conceding the fun in Juan Uribe hitting a home run off him. Uribe’s homer was really the only hard-hit ball off Kershaw in his opening session. Yasmani Grandal, who was firing rockets off his bat in batting practice today, gets an encouraging first assessment from Steve Yeager in this story by Lyle Spencer of MLB.com. Kershaw finished No. 1 on MLB Network’s Top 100 players of the moment. Non-roster pitcher Erik Bedard will start the Dodgers’ Cactus League opener Wednesday against the White Sox, with Kershaw on tap for Thursday. Neither is expected to go more than two innings. The team will then have a pair of split-squad games Friday. Eric Stephen has more on the starting pitching at True Blue L.A.
Stephen also provides this helpful reminder that Spring Training records don’t matter. Since 2008, the Dodgers have played no better than .500 in Spring Training, and no worse than .494 in the regular season. This could hurt my plans for Austin Barnes to make history as the Dodgers’ first true catcher-second baseman. Farhan Zaidi told Ken Gurnick of MLB.com that the team wants Barnes to focus on catching for now. I didn’t know Juan Pierre, but he always seemed like a wonderful guy, regardless of the debate that surrounded him. He was a symbol of the divide between Old School and New School thoughts about value in baseball: lots of hits but low OBP, lots of steals but a mediocre success rate, lots of joy in the clubhouse but questions about how much that translated into wins. His third year as a Dodger, in 2009, was his most interesting one. Beginning the season on the bench behind the burgeoning talents of Matt Kemp and Andre Ethier and the massive presence of Manny Ramirez, he surged back into relevance once Ramirez was suspended, with a .365 OBP, and by the time the summer dust had settled, numerous people argued he was the team’s most valuable player, keeping them alive for what ended up being a run to the National League Championship Series. A look back at that year through Fangraphs shows that even playing 41 more games than Ramirez, Pierre trailed him and five other Dodger position players in Wins Above Replacement for the season, retroactive evidence for those of us who felt thankful for the way Pierre had stepped up but didn’t quite see him as the MVP. But saying that he was overvalued doesn’t mean that he shouldn’t have been valued at all. Those are two different concepts, that I like to think we have a better understanding of today. Pierre had four seasons in his career of more than 200 hits, and at one point was a legitimate candidate to get 3,000, at a not-so-long-ago time when 3,000 hits was a Hall of Fame guarantee. As it is, he retires today with 2,217 hits — no small feat — and 614 career steals, which is 18th in MLB history. He also leaves with a reputation as one of the nicest guys in the game … and with his sense of humor intact. Not too shabby. Best wishes to him. GLENDALE, Ariz. — Much has been speculated about the upcoming timeshare arrangement for the Dodgers in 2015 at catcher, but third base might not be much different. After batting .311 with a .337 on-base percentage and sterling defensive work, Juan Uribe is the clear starter at third. 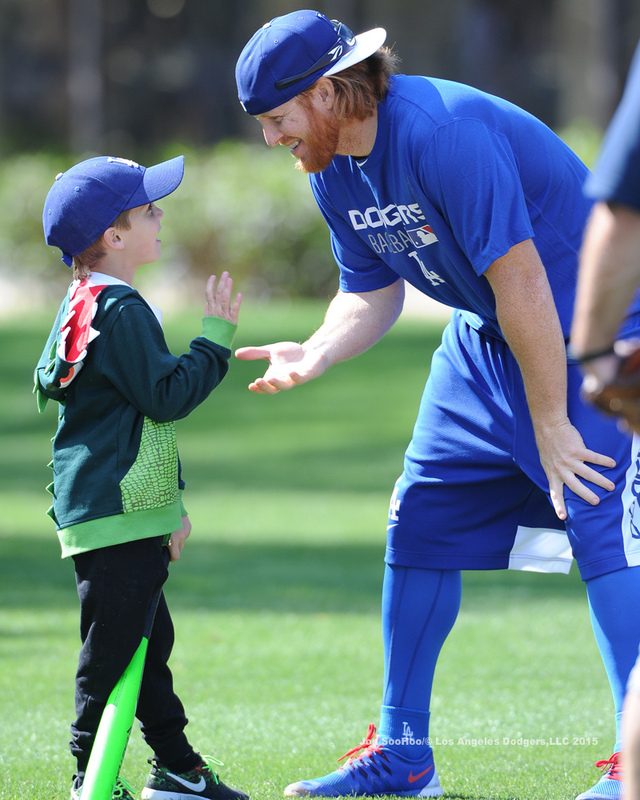 Justin Turner is the team’s No. 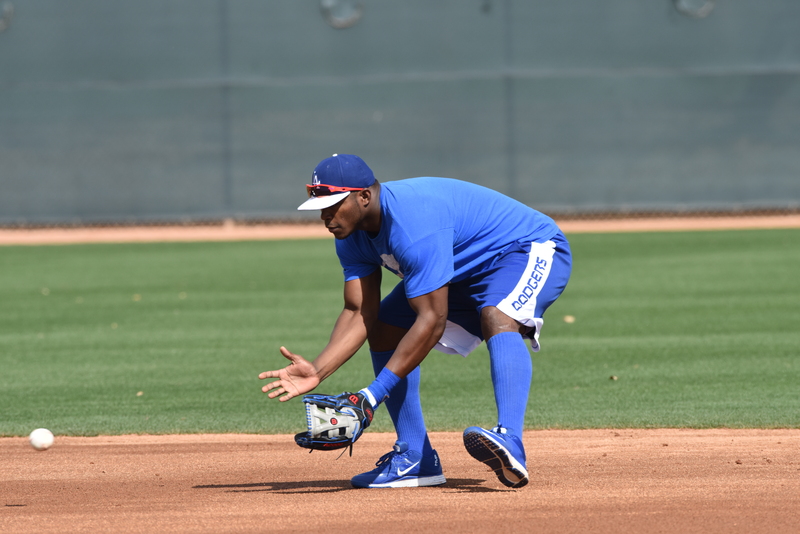 1 infield utility player, becoming the first Dodger since Jose Hernandez in 2004 and sixth since 1924 to play more than one game at first, second, third and short. But injuries limited Uribe, who turns 36 in March, to 103 games (98 starts) last year, opening the door for Turner to approach the 59 games (45 starts) he had at third in 2014. 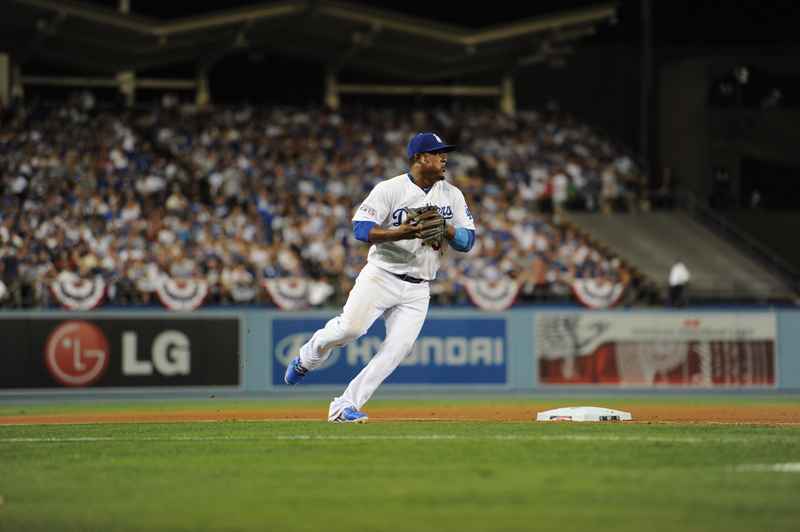 While Mattingly is wary of overplaying Uribe, he also finds that Turner wears down if he plays too often. That being said, he raved about Turner’s physical condition heading into camp this year. Thanks to official MLB historian John Thorn for sharing this February 1947 letter from sportswriter and Jackie Robinson confidant Wendell Smith, addressing Robinson’s concerns for the coming year. An excerpt appears above, the full letter is below (click to enlarge) and at this link. 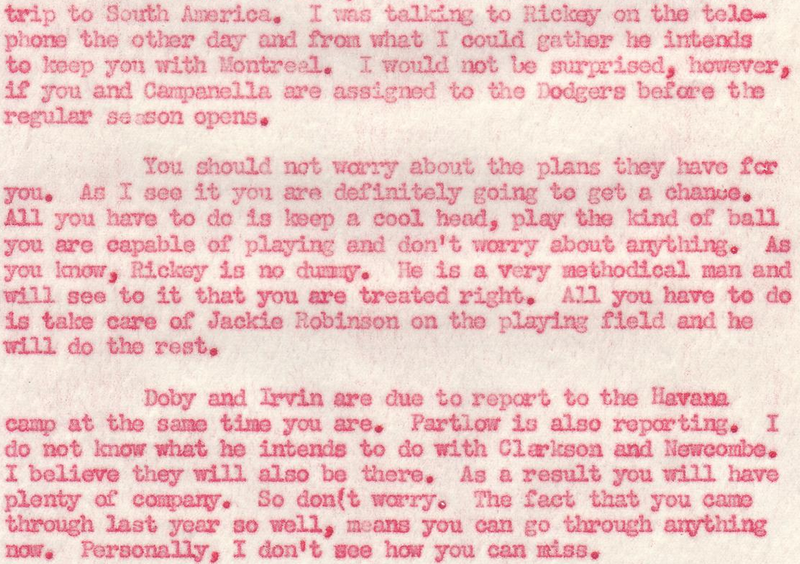 Also linked here: Branch Rickey’s January 1946 letter to Smith on the issue of making plans for Robinson to go to Spring Training in Florida. 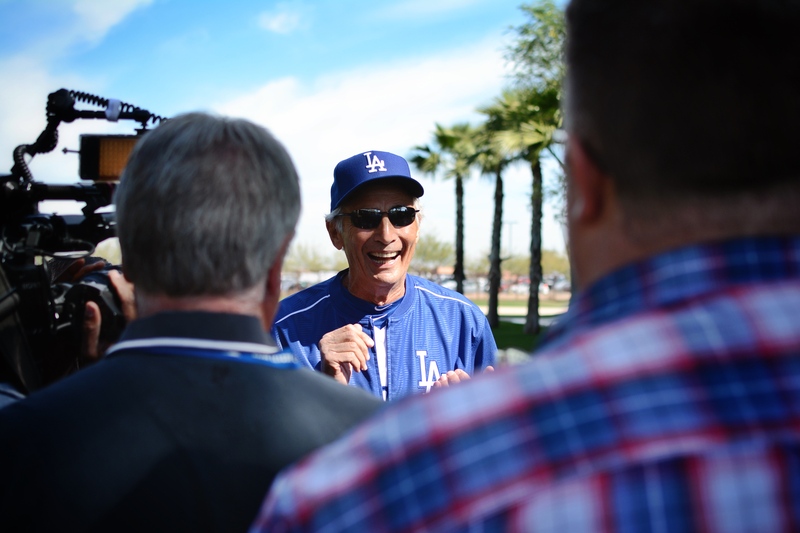 GLENDALE, Ariz. — Highlight of Spring Training/2015/Dodger life and Hall of Fame pitcher Sandy Koufax is at Camelback Ranch, and a reporter asked him today if the juices were still flowing when he put on the Dodger uniform. Nevertheless, the joy of the annual ritual wasn’t lost on the great lefty. “It’s fun,” he said. “It’s fun to be around the players. This is a nice time of year — nobody’s lost their job, everybody’s got a job coming. Everybody’s positive. It’s a good time to be around baseball players. “If somebody had told me that anybody would beat Clayton twice in one series, I’d have said ‘No way.’ I probably would have cursed and said ‘No way.’ But it happens. And I have to say, I don’t know if you heard his (award) acceptance speech in New York, but that last line was as classy as it gets. On a night where you’re being honored, to bring up what didn’t go right is pretty classy, pretty special. “They just wouldn’t operate on an arthritic elbow in those days. It would be a simple surgery. I had arthritic hooks that would be scratching, and my elbow would blow up, fill up with fluid. Then they’d drain it, send you back out there. Surgery would have been easy, they would have done it when the season was over and be fine in Spring Training. They wouldn’t have cut anything — just hammer and chisel. “I have a lot of theories (on the epidemic of surgeries). Mechanics. I think a lot of people don’t use the lower half of their body as much as people used to. They’re much more straight up and down. 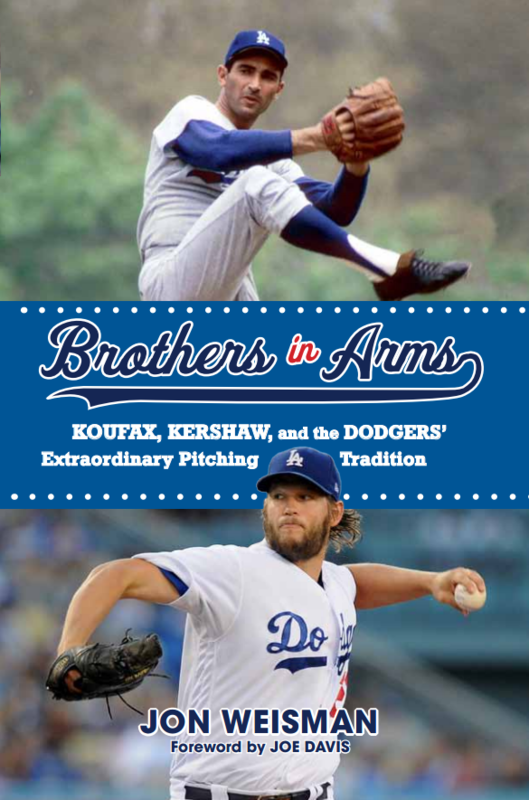 Plus, people are doing it prophylactically — before they have a bad elbow, they’re doing Tommy John. “I’m not sure what pace of play is bad. It’s slower than it used to be, but you get three more pitching changes than you used to get, so that takes time. I think the strike zone has changed shape — I think it’s gotten narrower and taller and lower. I think a wider strike zone and not necessarily and not necessarily higher and lower would speed up the game. That’s just my opinion — by no means humble opinion. “It’s not so much the time of the game. I find it hard to watch a pitcher go two strikes and no balls and end up 3-2, and that happens much more than it should. “I think Maury changed the game. He revolutionized the game. He was the most dominant offensive force in baseball, even though (Hank) Aaron might have been the best hitter. Every time Maury got on, it was a double or a triple. The picture above, of a ball thrown by Clayton Kershaw, efficiently shows he is able to strike out the side at any given moment. Kershaw had identical strikeout-walk ratios to righty and lefty batters in 2014, a development that intrigued Alec Dopp at Gammons Daily. Joel Peralta, who is behind on his throwing program, could join Kenley Jansen and Chris Withrow on the Opening Day disabled list, reports Ken Gurnick of MLB.com. Hyun-Jin Ryu was held out of workouts today but is expected back Thursday, reports Gurnick. Newly signed Chad Gaudin missed the 2014 season after having a rare surgical procedure, unprecedented for an MLB player, writes Eric Stephen of True Blue L.A.
Stephen also has an entertaining notebook of Week 1 Spring Training observations. Ryu is the Dodgers’ fastest-working pitcher, and Peralta the slowest. Read more about it from Dustin Nosler at Dodgers Digest. 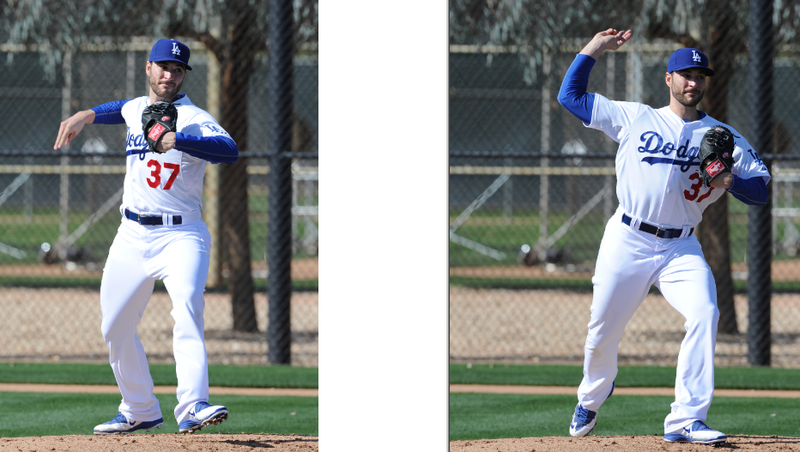 Paco Rodriguez talked about his offseason adjustments with Ron Cervenka of Think Blue LA. Alex Guerrero’s thoughts about changing relations between U.S. and Cuba and his evolving status with the Dodgers can be found in this piece by Bill Plunkett of the Register. Andre Ethier talked to reporters today after meeting with Andrew Friedman, Farhan Zaidi and Don Mattingly about his prospects for 2015 in the Dodger outfield. Ken Gurnick has more at MLB.com, while Tim Brown of Yahoo Sports adds his own perspective. 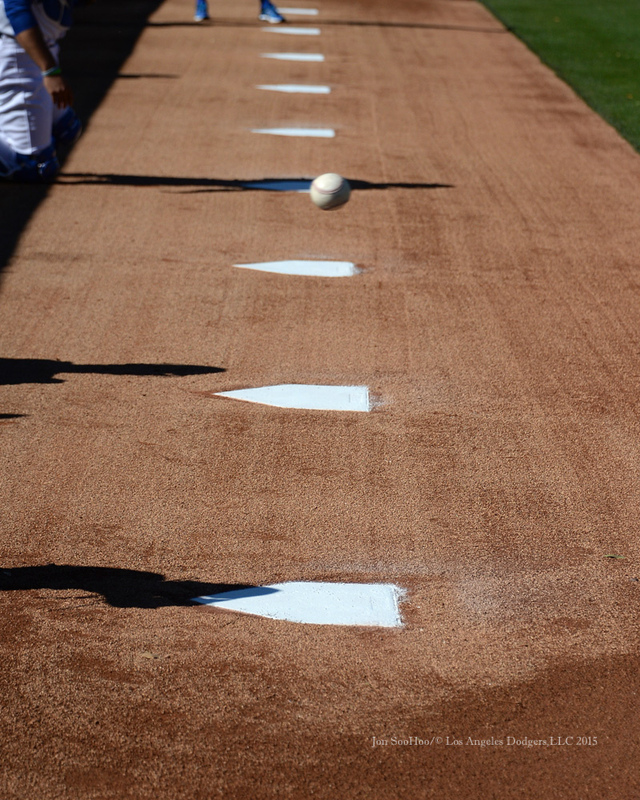 Zack Greinke had his first 2015 Spring Training bullpen session, which Gurnick covers here. 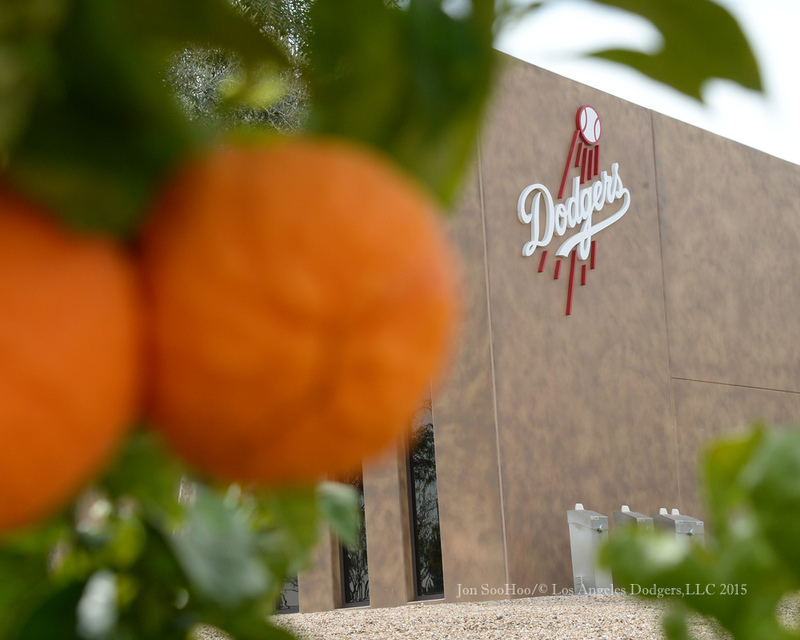 We touched on this subject recently, but Historic Dodgertown posted a piece on “Dodgertown and the Integration of Major League Baseball Spring Training” by Jerald Podair. Some great history within. On Monday, photographer Jon SooHoo captured this no-name guy — not even on the depth chart at shortstop — looking to give Jimmy Rollins a run for his money. When Dodger pitcher Brandon McCarthy and writer Molly Knight struck up a spontaneous — and particularly interesting — conversation about clubhouse journalism late Monday on Twitter (captured here by Lana Berry on Storify), it struck a nerve within me because of all the mental wrestling I’ve done on the subject. I was lucky I was able to fall asleep last night. There wasn’t really a place for me to jump into their exchange, but given 36 hours between their chat and my own departure for Spring Training, here is a semi-coherent window into my mindset and experience. When I wrote about injuries, this isn’t what I had in mind. Scorpions are tough … but Dodger public relations manager Jon Chapper is tougher. 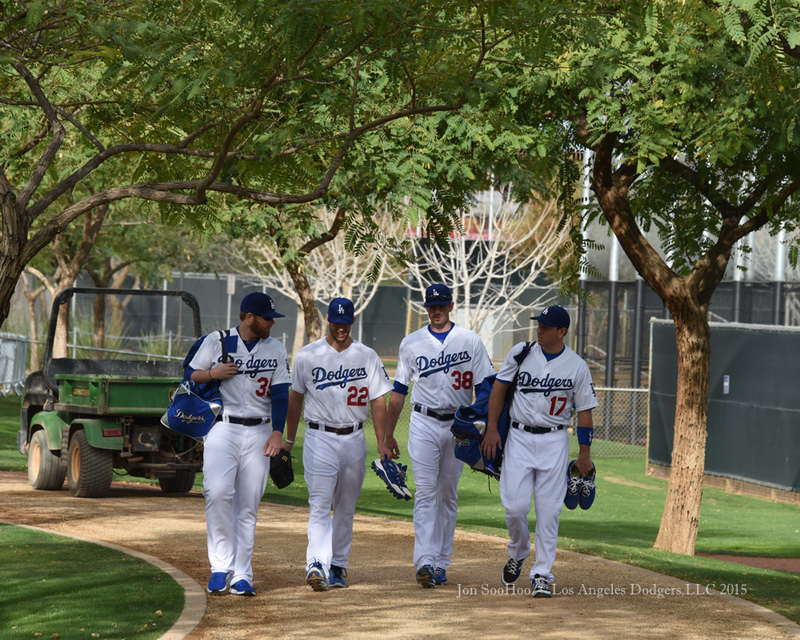 Brett Anderson, Clayton Kershaw, Brandon McCarthy and A.J. 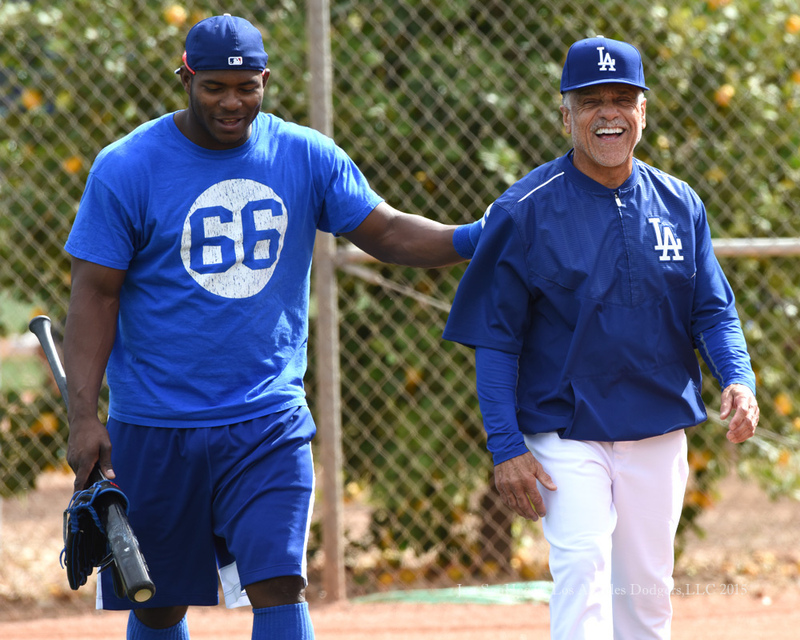 Ellis stroll through Camelback Ranch on Monday. For more images from today, visit LA Photog Blog. The circumstances surrounding Kenley Jansen’s foot surgery are detailed by Ken Gurnick of MLB.com. 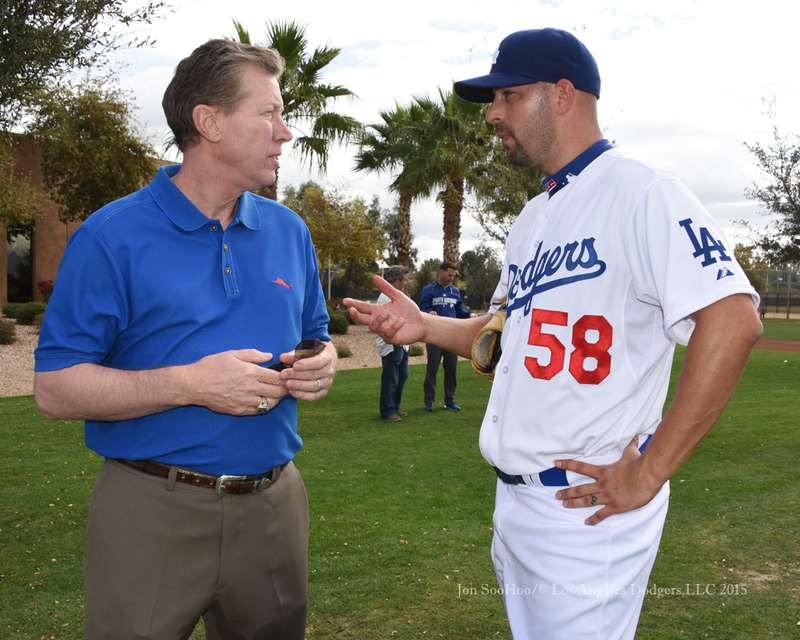 The effort of David Aardsma (pictured at right with Orel Hershiser) to reinvent his mechanics is the subject of a lengthy feature by Gurnick. 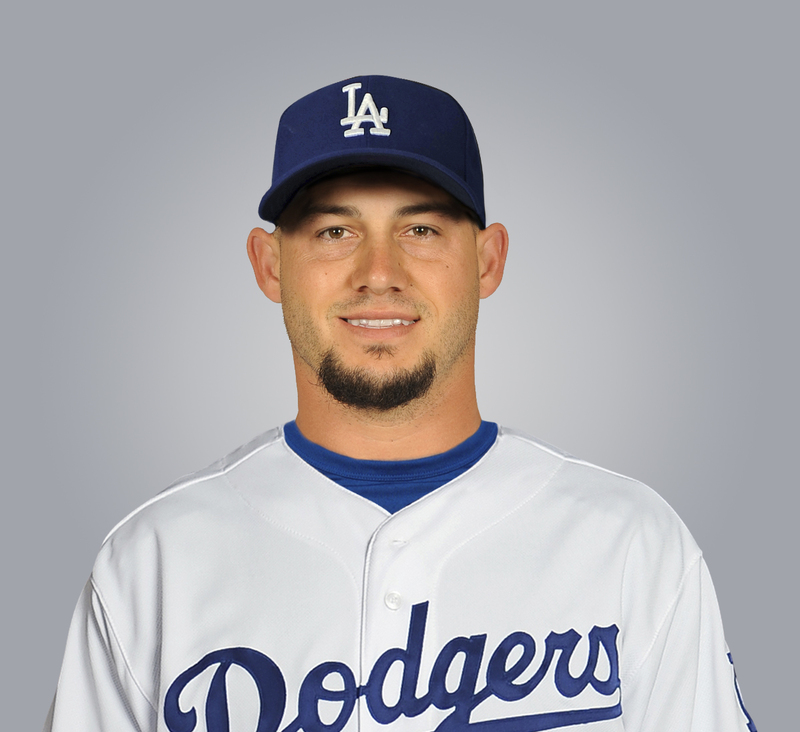 The newest newest Dodger, Dustin McGowan, is discussed in this Eric Stephen piece at True Blue L.A.
Stephen also offers some perspective on Andre Ethier, who reported to camp today. Mark Saxon delved into the topic of Dodger players and social media at ESPN Los Angeles, including an interview with our old friend Josh Tucker. Brandon McCarthy, Brett Anderson and David Huff also had interesting things to say to Saxon. J.P. Hoornstra of the Daily News explores the Dodgers’ process of determining Julio Urias’ workload in 2015. It’s not out of the question that MLB could revert to a 154-game season, according to new MLB commissioner Rob Manfred, though don’t look for it anytime soon. What is your opinion of Dave Kingman’s performance? As Will Leitch writes at Sports on Earth, it might deserve to change, given the current era of strikeouts. Farhan Zaidi won the Dodger front-office Oscar pool by picking 20 out of 24 winners. 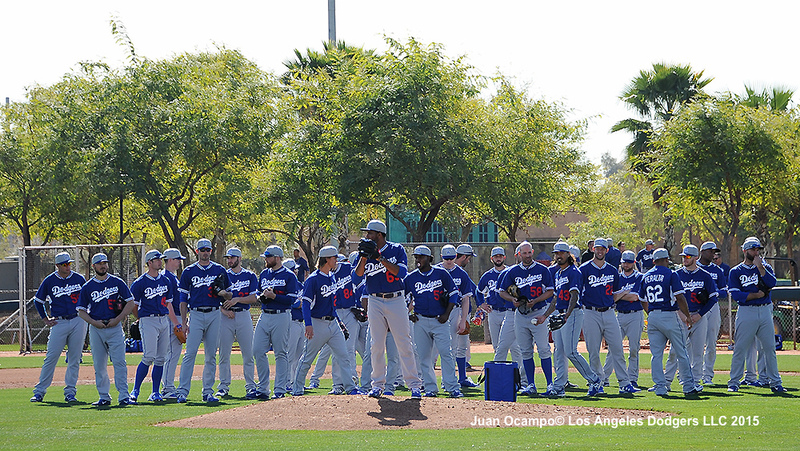 Meanwhile in Los Angeles…42 days until #OpeningDayLA. Continuing to place bets on pitchers on the mend, the Dodgers have signed former Toronto righty Dustin McGowan. Recently signed Brandon Beachy, as planned, will go on the 60-day disabled list to make room for McGowan on the 40-man roster. McGowan, who turns 33 on March 24, has had surgery to repair his labrum (2008), ACL (2009), rotator cuff (2010) and shoulder (arthroscopic, 2012) and was also on the disabled list in 2013 with an oblique strain. In 2014, he pitched 82 innings — his most since 2008 — allowing 116 baserunners while striking out 61. He made eight starts in 53 appearances, and in his career, he has started 68 games and relieved in 90. As a reliever in 2014, McGowan had a 3.35 ERA, allowing 50 baserunners in 43 innings while striking out 36.